The wide-open spaces alongside the highway began to populate with houses and shops. Buildings painted blue and orange and red began to imbue the countryside with color. Our bus rambled to a stop in a dimly lit, dodgy alley in the 500-year-old city of Granada. Neil, Tim, and I hoisted on our packs and walked toward sunnier streets. A few blocks from the alley, we wandered into Oasis Hostel and threw down $20 USD for a private room and access to an oily looking swimming pool the size of a large dining room table. Perfect. At dusk, we wandered our way into a pub for a dinner, before venturing back to our hostel. We spent the evening sipping beers and Flor to Caña rum on the concrete slab next to the tiny pool, listening to the always-interesting traveling circus of backpackers who were temporarily inhabiting the hostel. 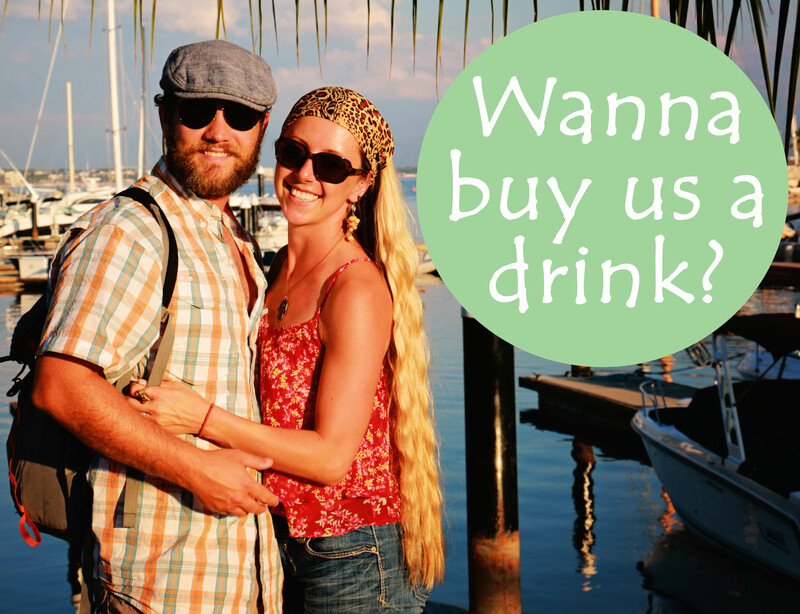 This was our second experience on the Central American backpacker circuit. We concluded that in contrast to the late-teen to early 20s demographic of backpackers in Europe, travelers here were older (generally 25 to 35 years). Probably a testament to the rougher reputation of the region. A 20-something lamented the challenges of funding her traveling addiction by trimming marijuana plants in northern California. Sally, a 30-something, shared her story of being on hiatus from her professional life, not unlike us. We were exploring opposite corners of the globe. She was backpacking Central America on her way to the Pacific Northwest; we were bound for her home nation, Australia. There was a yogi, a butcher, a baker, a candlestick maker. You know, the usual suspects. Morning brought lazy exploration around town for Tim, Neil, and me. 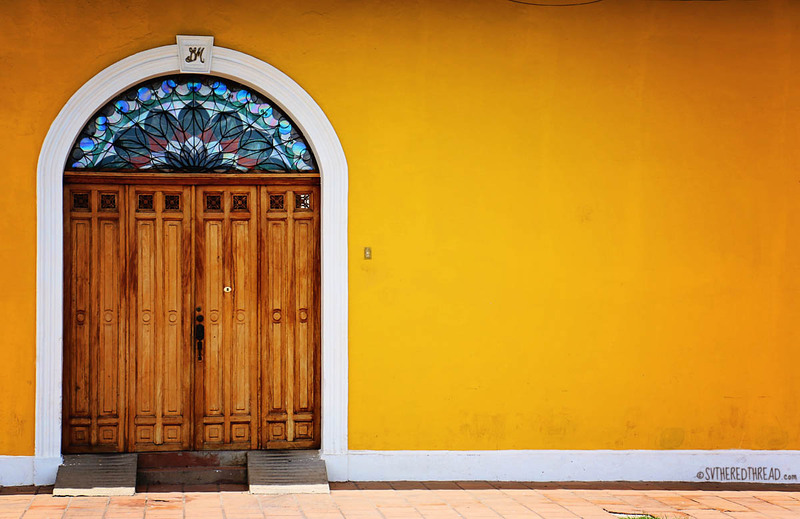 The stunning colonial architecture was reminiscent of Antigua, and it felt nice to stretch our legs. We walked past bright, intricate murals and beautiful, decaying doors. We climbed the bell tower at Iglesia la Merced, where a statue of the Virgin Mary stood atop a steeple and gazed serenely over a sea of roofs festooned with Spanish tiles. The façade of Granada’s lemony cathedral jutted radiantly from the colonial cityscape, a masterpiece for the eyes to behold. 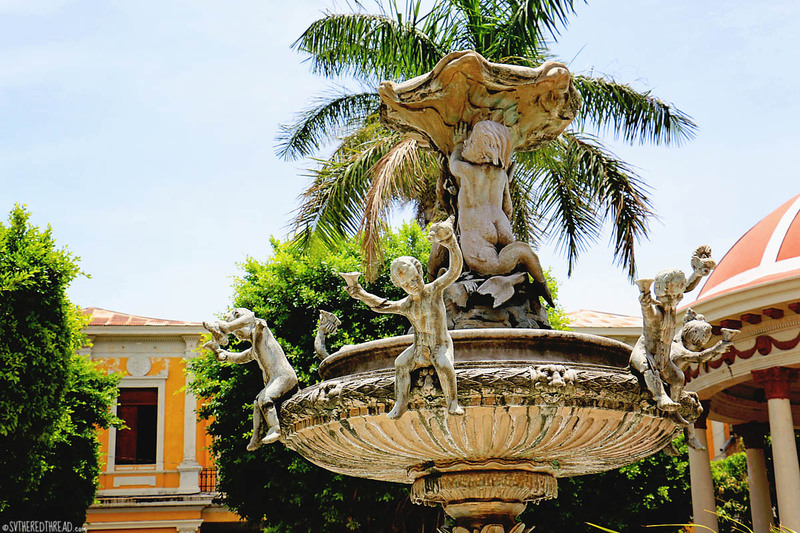 Activity in Granada’s Parque Central, orbited around an ornate fountain where five cherubs teetered atop a saucer, waving conchs wildly about like little drunken rabble-rousers. 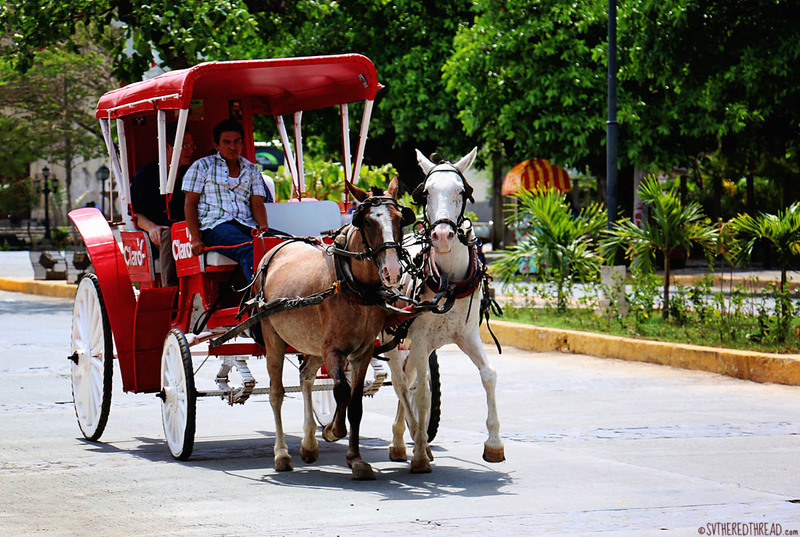 Trees shaded souvenir stands and provided locals and tourists refuge from the heat, and horse-drawn buggies clicked along the surrounding streets. We wandered down Calle la Calzada, a pedestrian-only street clad with dozens of quirky restaurants, outdoor cafés, and flowery courtyards. We hadn’t seen such a diverse array of food choices in months. While meandering the Calle, we bumped unexpectedly into Becky and Dave, a Brit-Aussie couple whom we’d met at our dive hostel in Utila, Honduras. The chance meeting was one of the highlights of our time in Granada! The day was steadily warming up; sweat beaded along our hairlines as we walked. It was time to get something to drink. Coconut water is among my favorite treats. For $1, a man plucked a soaking coconut from a water-filled cooler, and with the finesse of Edward Scissorhands, he used a machete to trim the fruit and give it a mouth. He dropped a straw in the orifice and handed me a refreshing taste of the tropics. Yum! Granada is a beautiful city, but steps from the clean, colorful streets, hidden just beyond the eyes of the tourist cameras, poverty thrives. 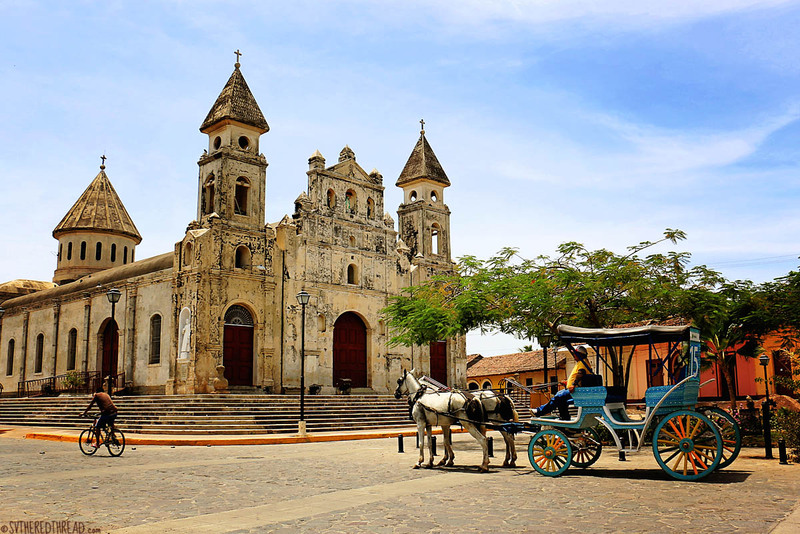 Nicaragua is the second poorest nation in the western hemisphere, second only to Haiti. Poverty is probably forced from the city center for numerous reasons. Among them, tourism. Tourism is an important source of income for the city, and vacation is rarely a time when people care to acknowledge at hard realities. 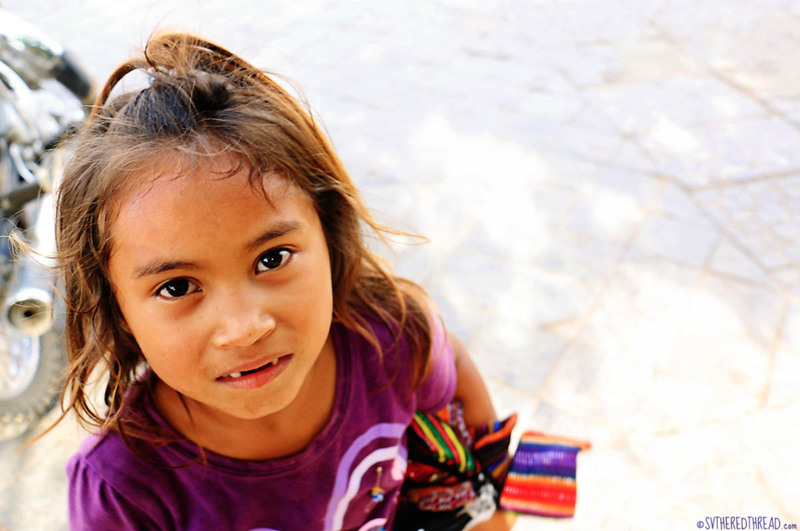 For the first time in Central America, small children ran up to us, hands outstretched, begging. A darling girl in a purple t-shirt and blush-colored tutu bounced toward us. Two missing front teeth said she was older than she appeared. In gestures and rushed words, she expressed her hunger and snatched half a hotdog from Neil’s hand the moment he stretched it toward her and turned to share it with two other little girls, presumably her sisters. Her mother pushed her toward us and asked us to take her. Neil and I both felt a bit stunned. Had we just been offered a child. Take her where? Keep her? Tears stung the backs of my eyes. For a moment I was transported to my time in New Delhi, India, in 2011, when poor children with open mouths and hungry eyes could be seen at nearly every turn in some neighborhoods. I remembered when a mother laid an infant boy in my arms and stammered repeatedly, “Go America…” She refused to take him back until I thrust him into the arms of the woman next to her, trembling. I choose not to imagine that the propositions by those mothers were out of anything but love, or perhaps fear; fear of not having enough resources to take care of the children. The next morning, we hugged Tim affectionately and made promises to meet again further south. It’s always fascinating how quickly bonds are formed when relationships begin beyond the bounds of comfort zones. 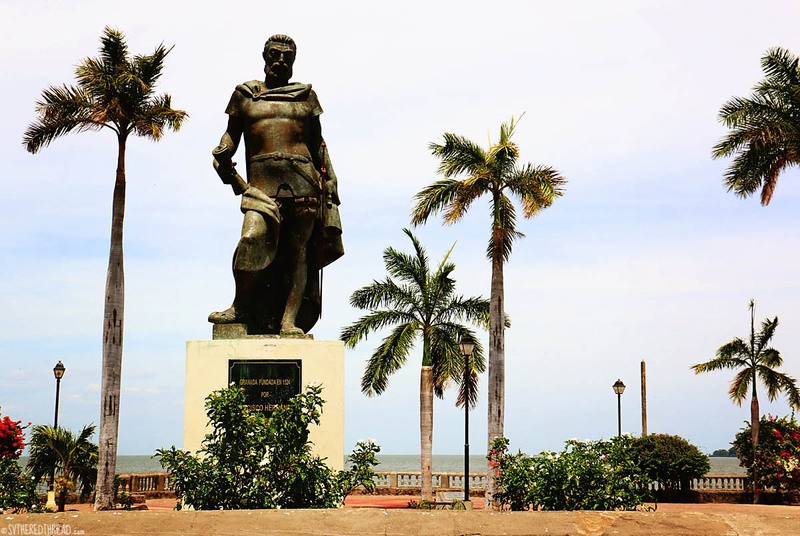 We plopped down on the red, vinyl seats of a chicken bus and began our road trip back to Chinandega and Marina Puesta del Sol. The backs of my sweaty thighs protruded from my jean shorts and stuck to the sleek surface. I shifted uncomfortably, as I reflected on our second major inland excursion. Our volcano experience had been challenging and fantastic! We both enjoyed our time in Granada, but it didn’t steal our hearts the way Antigua stole Neil’s or León captured mine. We wished we would’ve had time to visit Omotepe, the famed volcanic island in the center of Lago Nicaragua, dubbed “the oasis of peace.” I tend to need frequent reminders, however, that we cannot boil the ocean. We’d seen a great many things on our two inland voyages, and we shall travel again in Central America someday in the future. It was time once more to get ready to take the sea! This entry was posted in By Jessie, Central America, Friends and loved ones, Inland Adventures, Nicaragua and tagged Granada Nicaragua, Oasis Hostel. Bookmark the permalink. Wow – heartbreaking and wonderful at the same time! $20 for a room? Hello….. but then, the kids… you could end up with a dozen or so you know? Sounds like an interesting trip! We met some of the South/Central America “backpacking” crowd in the Galapagos – they had some fascinating stories that made us a little sad we hadn’t had time to see more of that area than Panama. But of course one can’t do it all, and we’re super lucky to have seen so much on the high seas! !